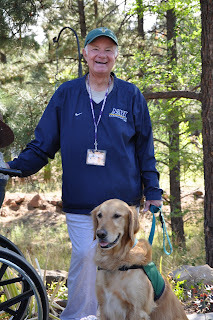 When my friend, Loni Shapiro, asked me to speak at a memorial service for Zane, a therapy dog, I looked at my own personal therapy dog, Roxie, to see what she thought about the invitation. A three-legged yellow lab, now white with age, she spoke from her soul through her eyes, making it clear that I should speak for Zane. Now, the word “therapy” comes from the Greek word “therapeia” which means “healing.” So, Zane was a healing dog. The service was held in the Olivia White Hospice Gardens where Zane had served many of the residents. Now, many people think that dogs don’t have souls. They’re generally people who don’t love dogs and don’t have dogs for companions. Some dogs, just like human beings, don’t have souls, but some do. Their souls can be seen in their eyes which I’ve heard are the windows to the soul. Some people have apparently traded their souls in for money and power, striking a Faustian bargain with the devil. Their eyes have no depth and are windows to nothing. They’re flat, resembling the eyes of snakes, cold, calculating, and predatory. Nowadays, our word for these flat-eyed people is “sociopath.” It’s always important to examine the eyes of the rich, famous, and powerful to find out if they’re flat. They’re a lot of flat eyes on television. Criminals are flat-eyed. Getting back to Zane’s soul, the reason why some dogs are healers is that they have souls and, thus, have what’s called “intraception.” A term coined by the late Harvard Professor H. A. Murray, it means the ability to understand the emotional and perceptual experience of another person. Without intraception people communicate only with shadows, artifices, and appearances, not someone else. 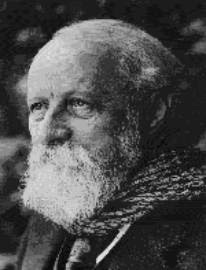 Martin Buber, the Jewish philosopher and theologian, made the same point with his distinction between I-Thou and I-It relationships. Without intraception, the world is one of I-It, a world of relationships with objects, not persons, a world of loneliness. For Buber there was always the Eternal Thou. A therapy or healing dog isn’t burdened with internal toxins, such as male abusers of women being terrified at heart of women. Flat-eyes see only objects to be exploited. Dogs understand the other person because they don’t have to fool around with all the internal conflicts that clog most people’s perception of others. In other words, they’re simple, and simplicity is always the beginning of understanding because clarity requires simplicity. Gardens are a great place to begin leeching these psychic toxins. Paying attention to our physical sensations draws us away from out inner, psychic turmoil. It’s difficult to stew in our indignations while smelling a rose or eating a fresh tomato. We equate gardens with peace for good reason. They bring peace to the soul. A healing dog in a garden, as at the Olivia White Hospice Gardens, is a great combination. Dogs not only draw us away from our fascination with our own malaise as do roses and fresh tomatoes, they also draw out the malaise because of their simple insight into our situation. A dog understands. As we run our hands along a dog’s back or hold its head in our hands, we can feel the tensions release. Dogs with souls are always happy to see us. Zane was adopted by Dave and Terri Hill of Munds Park and Cottonwood from Rescue a Golden. Terri said of Zane, “Dave and I learned a lot from Zane.” “Compassion and feeling is what we absorbed from his presence.” Now, Zane has a successor named Murphy. For more information, Dave and Terri can be reached at mthill2007@gmail.com.